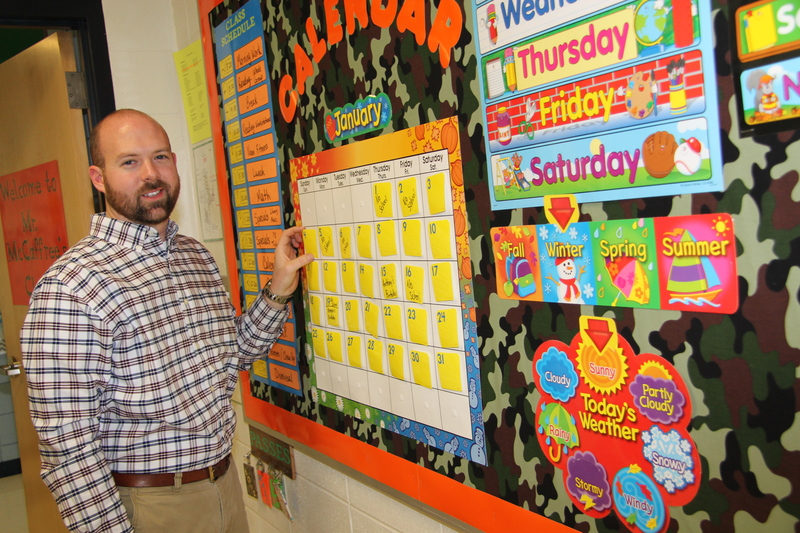 Ruth Clark Elementary School first grade teacher Caleb McCaffree checks his classroom every morning to ensure everything is ready for another day of learning and engagement with his students. McCaffree’s attention to details, instructional skills, professionalism, classroom management skills and willingness to go above and beyond inside and outside the classroom has been acknowledged with the highest state award for first-year teachers. McCaffree was recently honored by the Kansas State Department of Education (KSDE) as one of thirty-two 2015 Horizon Award recipients recognized as exemplary first-year educators. The program is a regional competition with four regions corresponding to the state’s U.S. Congressional districts. Four elementary and four secondary classroom teachers may be selected for the award from each region. To be eligible for the award, teachers must have successfully completed their first year of teaching and have performed in such a way as to distinguish themselves as outstanding. The KSDE Horizon Award Program began in 2003. Prior to McCaffree’s award, Haysville USD 261 had five recipients. Honorees are: (2007) Micah Friesen, Nelson Elementary School; (2009) Jessica Bloyd, Haysville Middle School; (2009) April Davis, Freeman Elementary School; (2010) Jarrod Craig, Nelson Elementary School; and (2010) Joshua Kelly, Tri-City Day School. McCaffree has worked at Ruth Clark for 8 years, beginning as a para-educator and is now in his second year as a teacher. He was very complimentary about the great opportunities he has had to watch and learn from wonderful Haysville USD 261 para-educators, teachers and principals. Being a Campus High School alumnus, McCaffree believes he has an advantage returning to work at Haysville USD 261. Ruth Clark Elementary Principal Carla Wulf believes McCaffree’s organizational, collaborative and technological skills make him a leader among his peers. Ruth Clark Elementary School teacher Shenae Stein applauded McCaffree’s commitment to going above and beyond in the classroom during his first year of teaching. Brooke Chadd’s son, Xander, was a student in McCaffree’s class during his first year of teaching at Ruth Clark. In McCaffree’s first grade classroom, excitement is contagious! Within 10 minutes of spending time in McCaffree’s classroom, three things will quickly become apparent: (1) He wants his students to learn, experience success and have fun; (2) He creates an engaging atmosphere in his classrooms to give students the best chance to succeed and (3) Students and their best interests always come first. As a Horizon Award recipient, during his first year as a teacher, McCaffree has distinguished himself in the classroom and built a foundation for his students that will last a lifetime.